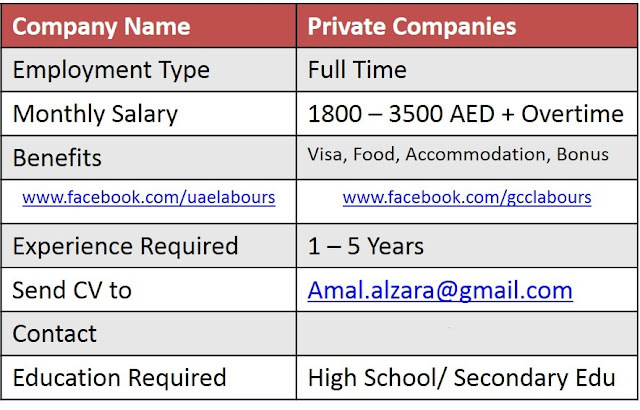 A company located in Dubai is looking for driver with own light vehicle and UAE visa for Cleaning Company in Dubai. He will Pick up & Drop off female staff. Please only apply if you have your own vehicle. We are looking for Asian driver candidates with valid Any U.A.E driver license. Hard working and trust worthy. know the road in uae. Benefits: Accommodation will be provided by the Company. We are looking for bike riders to deliver food in Dubai. Please mention your age, date of issue of the UAE Motorcycle License and the current salary in your application. 2: Age must be 23 years old and above. 3: Must be Familiar with Dubai locations. 4: Should be able to read/write/speak English. 5: Candidates on Visit/tourist Visa are preferred or Immediate Joiners. 6: Computer / Tab and other gadgets experience is plus point. Benefits: Commission and Transport will be provided by Company. A Family living near SHARJAH AIRPORT is looking for a family Driver on urgent basis. 4: you should have a UAE driving license. 5: Good experience in Sharjah and Dubai streets. 6: To work immediately and join now. 7: Age between 28 to 45. Benefits: 1 Time Meal, Room, car will be provided for free. 4: Merchandise product on supermarket shelf display. Working hours will be 8 to 10 hours a day, 6 Days work, Friday off. Contact: 04-2695161 (This is Recruiting Company, please be careful). A Private Company located in Dubai is in need of a Driver with his own Car and Visa. We need a person with personal car and his own visa, only apply if you have your own vehicle and have your own visa. This is full time Job, good salary with allowances will be provided. Salary will be final after Interview. There is no contact detail in job no 6.